It's FRIDAY! WOOOOO! We made it guys! To honor this glorious TGIF, a freebie is in order! 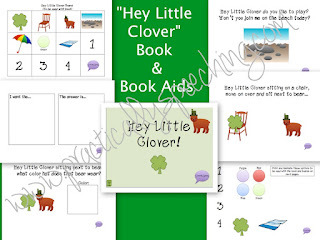 My brand spankin' new activity "Hey Little Clover" will be free until 5pm TODAY. After that it will be on TpT for you to check out and purchase at $1.50! Here's what this great book is all about! "Hey Little Clover" is a book that can be used with a variety of students based upon their age, functioning level, nonverbal/verbal status. It follows a little clover through the book that must change locations/positions/activities based upon what the text says. The whole premise of this book is to use the manipulatives and have your student move the clover based on what the page says. There is some (okay, a lot) of laminating and velcro-ing that you'll be doing, but it'd definitely worth it! You can download this cute activity and book HERE on TpT!